Format: A really pretty trade paperback that has the great fancy paper for the cover... I am very tactile with my books, I am realizing. 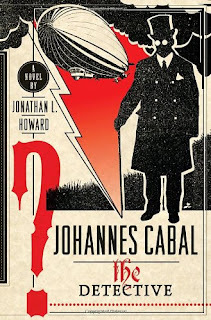 Summary: Johannes Cabal is a freelance necromancer, adventurer, and general ne'er do well who has found himself at the wrong end of the dictatorial law in the German state of Mirkarvia. He just stole a little old necromancy book from the state library, landing him on death row in a depressing dungeon. We follow him to the executioner's chamber, to a deal with a political devil, to a daring escape, to a voyage to safety that involves him in a disappearance that he cannot help but investigate. Supported by a cast of politicians, aeroship crew, captains of industry, leisured ladies, friends, and enemies, Johannes Cabal wields his own unique blend of cold pragmatism, mysticism, and social awkwardness to get to the bottom of things. These made me chortle awkwardly in front of my roommate. I don't know where to go with this, because this is just such an odd and weirdly wonderful tale. Howard very successfully strikes a tone of irony and whimsy, which is just my favorite (see above). I love the detached tone the narrator has from the absurdities of the tale - somewhat reminiscent of P.G. Wodehouse, in that the author is ironically removed from, but not maliciously inclined towards, his characters. This tone is candy to me and combined with the superior prose, I slurped up every page with noisy delight. I think my roommate thought I was pretty weird, giggling manically on the couch. What makes talking about this book difficult is that it is playing with so many genres and has so many reference points in the overall canon that your expectations are constantly being set up and thwarted. The first 50 pages read very much like a action/adventure story a la The Three Musketeers meets The Princess Bride. The next bit reminds me of the aeroship scene in Indiana Jones: The Last Crusade. The middle chunk is a straight homage to Death on the Nile and Murder on the Orient Express. The ending of the main plot was a Nazi free version of Inglorious Basterds. Then the little short story appended as a coda is The Mummy meets Indiana Jones and the Temple of Doom, complete with rope bridge. And even though I've given you a lot of references for the whole book, I really haven't revealed the plot (though if the above were literally spliced together into a book/movie combo, I would be there with bells). Howard succeeds in keeping you guessing in a way that feels genuine and resolves things logically and with a good deal of satisfaction. I've been describing the mood/tone/whatever you want to call the general atmosphere of the book, and this is where it shines. It's a page turner, not driven by the well formed characters and interesting plot, but by the compelling desire to remain engrossed in the world. It was a place I wanted to be, pure and simple. And we haven't even talked about the fact that it's steampunk! At least, I think it is... corsets + helicopters = steampunk, right? Well, I'll say that it is, and I was surprised by my enjoyment of this new subgenre. Writing was excellent; characters were fascinating; plot was interesting; world was engrossing. What more could you ask from a book? Loved it and I think this would connect with a wide range of readers. That ends my ventures into genre - quite a success, I think, and makes me excited to dive into more genre offerings throughout the year. What's your soft spot when it comes to genre?